Workplaces are slowly disappearing. In their place we have workspaces. There’s a subtle but important difference. Instead of being confined within walls, people are increasingly working in a virtual environment. The digital workspace contains all the tools we need to work effectively but the workspace can exist in an office, a train carriage, an airport or a café. This is the age of anywhere working. Advances in mobility enable us to work productively regardless of our location. And research suggests that’s exactly how today’s professionals want it to be. Some researchers say that by 2020, half of the UK’s workforce will be working remotely. Although the predicted pace of change has been the subject of some debate, there is clearly a move towards mobility, particularly among millennials who are even less attached to fixed offices than older generations. Millennials matter. Over the next several years, more than 50% of the workforce will be made up of millennials, championing more open collaborative workspaces, a greater sense of purpose and a deeper connection to their company’s mission. For IT leaders, this change raises questions about connectivity, communications, data security and governance. It also demands an assessment of what employees actually need in order to work remotely. Traditional laptops are considered by many to be too cumbersome to carry around on a daily basis. At the same time, mobile devices such as phones and tablets have not offered sufficient functionality to keep workers fully productive when they are on the move. 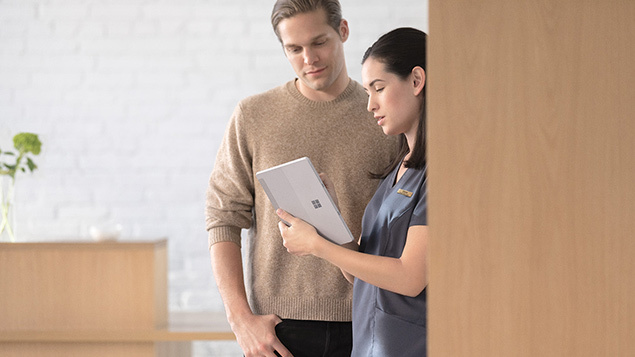 The Microsoft Surface family of premium laptops combine the light weight and intuitive touchscreen technology of a tablet with the productive power of a laptop. The devices feature a well equipped keyboard, which is detachable on some models, plus an optional pen and an on-board suite of apps and tools to meet the needs of the busiest executives and most demanding creative professionals. Afraid of losing battery power? Not with Surface. It’s got enough stamina to keep up with anyone’s workload. Taking notes? Microsoft’s OneNote serves as a canvas to capture, organise and share notes from any device. Users can record or handwrite notes, annotate documents, or sketch out their big idea with the natural feel of pen and paper. There’s also the option of taking a photo of a whiteboard and Office Lens will digitise the notes. Built-in translation fosters collaboration and powerful search scans across voice-recorded, typed and even handwritten notes. Another way to capture the moment is via video. Real-time interaction is more important than ever to keep mobile workers from becoming isolated. In tablet mode, Surface devices are ideally suited to being passed around the table so that the team has visibility of notes and ideas. There are circumstances when the barrier created by an upright laptop screen gets in the way of one-to-one interaction. For people who are not within reach, solutions such as Skype and Teams enable instantaneous collaboration. Teams is also fully integrated with Microsoft applications including Word, Excel, PowerPoint, PowerBI and Stream, so the team can collaborate and access information without leaving their shared workspace. Storing files in the cloud with SharePoint and OneDrive enables employees to access the data they need from anywhere and safely share content with anyone inside or outside the organisation. The Surface family make perfect creative partners. New co-authoring, intelligence, inking and 3D capabilities in familiar Office applications like Word, Excel and PowerPoint make it easy for employees to quickly mock up concepts, share with others and then work together in real-time to perfect the solution. AI takes this to the next level by facilitating new methods of input, such as dictation that can be transcribed and translated, as well as cloud-powered design suggestions to enhance presentations. There is also a range of specific applications to help projects progress, such as Adobe Creative Cloud, SurveyMonkey and GitHub. To accelerate mobile productivity, applications like Outlook, Word, Excel, PowerPoint, SharePoint, OneDrive, and Microsoft Teams are seamlessly accessible on Surface. Workers can create, chat, share and present – all from one device. Microsoft has also introduced AI to Outlook to help users get more done with a Focused Inbox that filters less important mail out of view so workers can focus on the emails that matter most. Similarly, Cortana helps Outlook mobile users stay on top of their day by providing reminders when it’s time to leave for an appointment. Importantly, these mobile experiences are secured so apps and data remain protected. To help enterprise exploit the very best advantages of the Surface family, CDW provides a range of wrap-around services that add value in important areas. 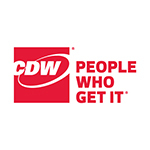 An extensive range of maintenance and support services are offered by CDW, underpinned by tailored SLAs and delivered by accredited engineers with demonstrable technical expertise. Design services, including the build of a main image, are also available alongside pre-delivery asset-tagging, deployment support and delivery.